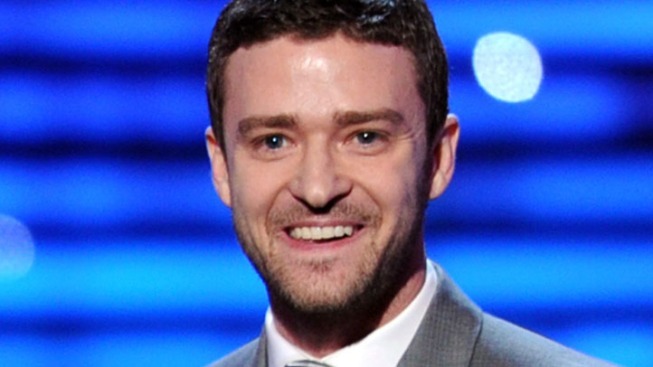 Timberlake is three years older than his "mom"
Justin Timberlake may take up an invite to the Marine Corps Ball. Justin Timberlake is three years older than his "In Time" co-star Olivia Wilde, but in their new big screen sci-fi project, the actress plays his mom. Access Hollywood caught up with the stars at the Los Angeles premiere of the Andrew Niccol-directed movie, where they dished about the movie where time is a precious commodity and people's ages stop at 25. VIEW THE PHOTOS: Celebrities Kissing & Smooching! "It's probably going to be a problem for the audience," Justin, 30, said of Olivia, 27, when asked about casting the actress as his onscreen mom. "But, in a good way," he added. Olivia told Access she jumped at the chance to play Justin's mom. "It's fun to experiment with playing characters that you would never normally be offered," she told Access. "It takes a visionary like Andrew Niccol to think of a concept so far out that I would get to play Justin's mom. I'm younger than Justin!" And making the movie – due out on October 28 – appeared to be a thrill for Justin. "Probably the most fun I've had yet," he explained. "I get to shoot guns, flip cars, kick a**, kiss a hot girl… It's like every boyhood fantasy I've ever had in the same movie!"